Here’s my second attempt at writing a comics review; you can read the first, on Tailsteak’s Forward, here. If you’re a creator of web- or print-based comics and you’d like me to write about your work, drop a line on Twitter (@readdoonesbury) or through my contact page. A while back, I received a copy of Stark Plug Book, a comix collection by Steve Chappell, aka Chap, a Madison, Wisconsin comics creator. I could say that Stark Plug is a somewhat absurdist humour comic following the adventures of a corporate drone, which it is, but it’s so much more than that. Stark Plug is a prime example of a contemporary creator working within the aesthetic developed by the comix creators of the 1960s and 70s and revealing the extent to which that approach to graphic narrative remains fruitful, while marking out his particular vision of the genre’s possibilities. Chappell claims that Stark Plug isn’t a political comic, calling it “pure entertainment,” a way to “get people away from the perils of their life.” I read the book a little differently. There’s an escapist feel, but Chappell’s depiction of what Stark is trying to escape from – the mindless drudgery of work in the capitalist system – is deeply political. We never learn what Stark does for a living, nor what “the plant” where he works produces. That’s what makes Chappell’s critique so effective: it’s not really about any one job or sector of the economy, it’s really about all of us. People cling to jobs they hate and in which they are “doing very little to better humankind” for the sake of the benefits package and “maximum vacation time.” Instead of doing work that brings people a degree of pride and satisfaction, people follow a daily rhythm of work that is boiled down to a manic boss yelling at his workers to “Increase production! Work faster! Quicken the pace!” with the underlying threat that if they don’t, “No raise for you.” Even Bernie the Banjo Bum, the homeless street musician who longs for a simpler time before cell phones and digital media pushed into a “rush-cession” of accelerating work and consumption, takes checks and credit cards; the logic of capitalism prevails even on frozen-over Midwestern sidewalks. Superimposed styles break the reader’s sense of narrative flow and continuity. Also, there’s a great contrast of dynamism and immobility here. The use of absurd humour as a way to engage in social commentary while providing readers with a fun read is a staple in the comix tradition; another comix touchstone that Chappell explores is the use of self-referential humour and commentary as a way to disrupt the relationship between author, characters, and reader. From the very first page, where Stark reminds his boss that as an “inanimate cartoon character,” he is unable to work harder, the book is full of instances of characters breaking the fourth wall and making observations about themselves, the pages within which their story unfolds, and the creator drawing them. This self-referential tendency is a key dynamic in the book’s central story, in which Stark quits his job at the plant to fulfill his dream of starring in a daily newspaper comic strip. Stark’s ensuing experience as a lead character in Memphis and Harry reads as an extended ode to the comics/comix replete with references to classic tropes and characters. I’m especially a fan of Memphis, a cartoon kitty whose love of fun, revolting excretory habits, and hippie wisdom are clearly a tribute to everyone’s favourite graphic feline, Fat Freddy’s Cat. Chappell is a block print artist (some of his prints are reproduced in one sequence of the book), and while some of his comics work reflects the heavier lines and more static feel that one (…or at least I) associate with that style, his style is dynamic and marked by sometimes-dramatic and sometimes-subtle aesthetic shifts to suit the moods he wants to convey. Chappell may favour a relatively simple drawing approach, but his drawings do complex things as he uses different visual narrative techniques, notably superimposing contrasting styles on a single page or in a single panel, to occasionally disrupt the narrative flow and the reader’s sense of being grounded in a definable reality. This is especially true in the sequence “Stark Walks,” which strongly evokes the “messing with your head” approach that was a key part of the underground comix, and in the “play within a play” sequence about Stark’s time as a character in Memphis and Harry, both of which, in different ways, bring the reader to a place where the rules of the straight world don’t apply anymore. Breaking the fourth wall backstage at a strip within a strip. Memphis’s wisdom and fun-loving spirit clearly evokes Fat Freddy’s Cat. It in was reading the Memphis and Harry sequence that I came to understand what this book is really about. Stark Plug is a comic book about comic books; from the depictions of office politics to jokes about how disgusting cats are to the ads for novelty products on the inside back cover, the book is full of references and in-jokes that any comics lover will appreciate, written in loving tribute to the medium. Chappell sets out to remind us of the amazing and unique possibilities that exist in the space between drawings and words and does so in way that draws deeply on the comix tradition while expressing his own artistic vision. Do yourself a favour and order up a copy. 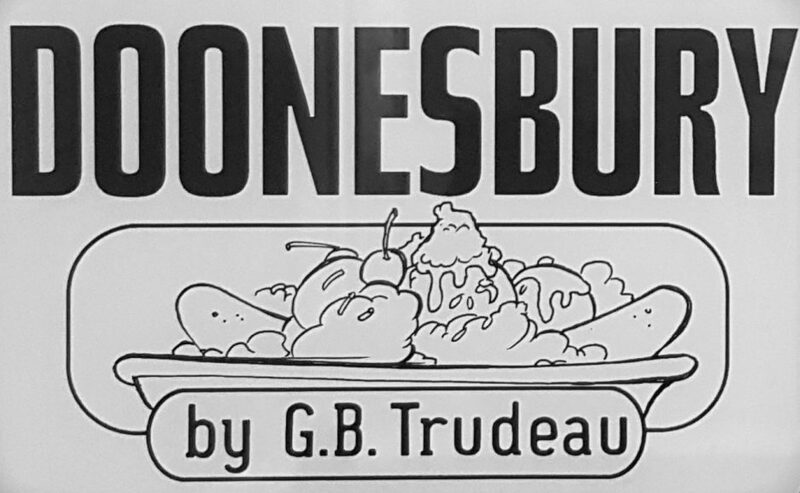 ‹ PreviousThis Week in Doonesbury: A Missed Opportunity. Next ›Meanwhile, on my other blog….